What is Fractal Art Missing? 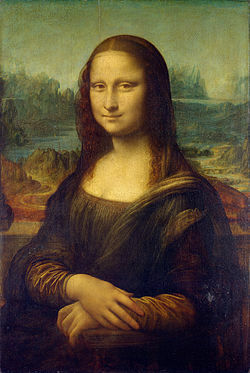 I look at da Vinci’s Mona Lisa and I see something. I look at just about any piece of fractal art and I don’t see that thing. What’s fractal art missing? Why does it always seem to be missing something that other art forms seem to have? I use the Mona Lisa as an example because it’s well known. I’m not really a fan of it, in fact my favorite part of this famous painting isn’t the woman’s smile, it’s the landscape in the background; that curvy snake-like road. But even the background of the Mona Lisa has that “art” thing that fractal art seems to be missing. It holds the viewer’s eye and just seems to do –that something. I know what art is: it’s the life of the image. It’s easy to tell the difference between living and non-living things. That’s why I’m confident in saying that fractal art is missing something that the Mona Lisa has. And yet fractals are fun and exciting and I think that’s what keeps us connected to them. But I’ve been “connected” for almost ten years now and I think that’s long enough to ask: Why can’t fractal artists do what other artists can do? I mean, why can’t they make art? I visited the Prado once. It’s a very large and famous art gallery in Madrid, Spain. If you like art, any kind of art, you’ll enjoy having a day or two just to wander around the Prado. I can’t imagine any piece of fractal art ever hanging in the Prado. It just doesn’t fit with those things. But why? That’s the big question and I think I can answer it. That is, now that I’ve been looking at fractal art of every kind for a decade now. It’s the reflection that’s important, not the length of time. But reflection takes time and after ten years worth I’ve arrived at some conclusions. I think most fractal artists are hopelessly deluded. But I’m jumping too far ahead. I’ve divided all this into a series of five blog postings; parts 1-5. This first one is to simply introduce what I think is the perennial question that pops into my mind whenever I start to wonder where fractal art is going or if it’s possible it will ever take any sort of place in the art world, meaning, will it ever be considered art by anyone other than those who make it and their devoted friends who cheer them on? Why can’t fractal artists produce anything with the same artistic merit as artists in other mediums like painting, drawing, sculpting and photography? What is fractal art missing that those other mediums are able to provide? Maybe some of you don’t think it’s missing anything and that artwork with a similar merit has already been made? Sure, I’d expect that. After all, I didn’t say fractal artists were hopelessly deluded for nothing. I know they are. I once shared those juvenile notions about fractals until I began to wonder why it all looks the same and there’s never anything significant ever made. I mean, anything worth hanging in an art gallery. I don’t believe the hype anymore. Rather, I’ve burst fractal art’s bubble and now see it as it truly is and how, ironically, I saw it in the very beginning. Fractals are fun, exciting and sometimes marvelously mysterious and a special world of their own. But I firmly believe that no one has, or ever will, create a real piece of art just by using a fractal program. Fractal algorithms just don’t have what it takes to produce anything other than mere decoration or design. As good as that can be, it’s lifeless when compared to real art. Not dead; just missing something. I’ve never been able to make peace with the term “fractal art”, simply because for me that’s similar to a term like “photoshop art”, or “watercolor art”. It’s a medium. It’s not even a medium, strictly speaking, it’s just a term indicative of the said artwork having certain fractal qualities such as scale variation, iteration, self repetition etc. It’s what you make with it that matters. OT has been advocating for this for quite some time now, with the term Phase Two Fractal Art. What’s changed now? I think fractals are no more or no less than tools to create art (or craft, if that is the use one wants to put fractals in), so it doesn’t make sense to me to claim that fractal art just doesn’t have that something. It’s like saying plastic sculptures just don’t have that ‘something’ iron sculptures have. It doesn’t make sense to blame the medium rather than the artist if there’s anything that merits blame. As for the ‘artists’, most of the people who work with fractals do not have a formal art training. Training is not a must for art, but it indicates dedication in being an artist, and provides one with mental tools that are not easily accessible without such training. Not all people who work with fractals have the tools or even the intention of being artists that fit your definition. This does not mean that fractals cannot be perfect tools for those who do want to make art with them. I think that 99.99% of paintings, sculptures, photographs, etc. has no artistic merit. Their authors, in some cases, think to be artists, though in most cases they are aware of being only amateurs, hobbyists or something like this. The so called “fractal art” is a form of digital art, where the tool/medium has something to do with fractal geometry. Most digital artists do not use fractals in their works. I have seen thousands of fractal pieces in online galleries, very few in real galleries and exhibitions, but this is a general trend involving all of the forms of digital art, which is considered B series art by the art business. Of course, 99.99% of the “fractals” I have seen are beautiful craft pieces. The rest, has artistic merits and nothing less than other forms of art. I do realistic figure work, landscapes, pure abstract paintings, and fractal art. I do the same art with fractals as with the other mediums. I don’t notice the difference in my artistic process when going from one medium or subject to another. The ultimate source and the underlying aesthetic remains the same. They can. I exhibit my fractal art along side traditional work all the time, one of my fractal pieces even won first prize overall in a traditional art show. One could argue the artistic merit of my work but the buying public seems to value it equally with traditional mediums. In my experience with a variety of mediums I don’t find that fractal art is ‘missing’ anything. Yes, it’s different and provides its own set of constraints and enabling capabilities. Pencil and white chalk are missing colour, that doesn’t make it an unsuitable medium. The comment about 99% of painted, photographed or sculpted art being crap is true. Probably 99.9% of fractal art is crap. Why?, same reason as the painted, photographed or sculpted work is crap….CONTENT. Being a great painter, draftsman, photographer, or having the latest UF, Mandelbublb, Apophysis does not make you an artist, it is being able to use the tools to express something that causes feeling, emotion or perhaps something more etherial. I completely agree that the large percentage of what we call fractal artists have duped themselves…that they hold and cling to their parameters like they are actually worth something is the most amusing aspect. The notion that fractals on their own will work as art has past us. To evolve into the state that The Mona Lisa resides, the fractal will not only need all the aspects of traditional art Mona Lisa has (colour, perspective, draftsmanship, etc, but primarily it needs to be emotive!!!) Since the public views fractals as or has representation in their mind of psycedelic swirls, or even solid design elements, the perception is little more. To be taken seriously, I feel fractals need to be used as elements of a work, where the swirls, coloring, shape or recursion becomes relative to some object, objects that humans can relate to….something to nail the image down and drive home its solidity. There are numerous examples in Dali’s and, even old masters works which contain fractal content. The same images that are famous for thier mastery also have elements of fractal genius. So fractals can be used successfully in great art, its already been done….but it takes more than owning a laptop and a few programs to be able to have an image relate to the masses……and artistic geniuses are not that common…in any media.